"You weren't ready for your mother and me to meet when she came into the shop the other day." "You sound like we're going to a war zone rather than out to dinner." Every Tuesday, Bibliophile by the Sea hosts First Chapter First Paragraph Tuesday Intros, where she shares the first paragraph or (a few) of a book she is reading or thinking about reading soon. Care to join us? It was almost lunchtime on Friday, and I was pacing. The museum exhibit I'd been anticipating for two months was finally opening that evening! My boyfriend, Ted; my friend Rajani "Reggie" Singh; her husband, Manu; and I were all going together. The guys weren't overly excited about the Padgett Collection textile exhibit, but they knew we were - and they were great guys, so they were taking us. Reggie was library director for Tallulah Falls's one and only library, Manu was chief of police and Ted was his head detective. I almost felt that we should be VIP guests, given the extra security Reggie and I would be bringing along. Angus, my Irish wolfhound, could sense my excitement, and he paced with me. I perched momentarily on one of the red club chairs that helped make up my embroidery shop's sit and stitch square, and he sat and placed his head on my lap. "It's all right," I said soothingly as I scratched his head. "I'm just excited about tonight. Reggie will be here to see you soon. Yes, she will! She's bringing lunch!" Another book in this series, "Thread on Arrival" was one of the first books I read when I discovered reading for myself again, and reading challenges. It is also one of the first cozies to land on my shelf. Come back next Monday for my review of "Thread End". Isn't it though, Lindsey? At first I was just going to put the first paragraph, but had to fit the dog in (he's on every cover in the series, I think). I like the war zone line. Captured my attention. Just wandering through on the A to Z road challenge. Thanks, Sharon. I loved yours as well. I may have to go back and read the Anne of Green Gables books all over again! Hey cool teaser. Thanks for stopping by my site. Thanks, C! Sorry about the trouble with my link, but I'm really glad you found your way here! Why does it sound like they are going to a war zone? I'm curious about the setting of this sentence/chapter. Are they irritated/frustrated because they do not want to go out for dinner? Was there a fight that broke out before the dinner? 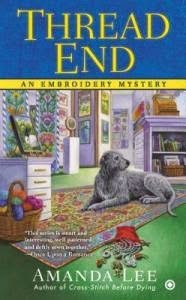 I love cozies and I've read several quilting mysteries, but I've never heard of an embroidery mystery! I like to read a book where the character talks to her dog. This sounds like a book I'd enjoy. Cozies are probably my favorite, Sandra, and they have all sorts: quilting, embroidery, knitting, cooking, renfaire, bed and breakfast. And they usually come with some sort of pattern, recipe or information about the particular craft involved. Thank you, Valentina! Congratulations on your cover reveal; it is GORGEOUS! Thanks, Gautami! I like that it shows most people expect an antagonistic relationship between in-laws ... that does not necessarily exist. I can see the draw to this one. It sounds good! Sounds good. Love the huge dog on the cover. I believe Angus is an Irish wolfhound, Nise'. He reminds me of a dog our neighbors used to have. That dog was big enough for my 11 year old daughter to ride! Sounds like it's gonna be a good read with some fun moments. It was, Freda! Thanks for stopping by!